For July's Charitable Partner Profile, we're sharing information about Columbus based, cancer research charity Pelotonia! We've been proud and honored to support the efforts of Pelotonia over the years but sponsoring riders (some even clients! ), donating directly, and raising awareness! Pelotonia was established in 2008 with one goal in mind: to find life-saving cancer research. Pelotonia itself is a three day event that includes entertainment, a weekend of cycling, and volunteerism. In its first nine rides, alone, Pelotonia raised more than $164 million for cancer research. Pelotonia directs 100 percent of every rider-raised dollar to cancer research at The Ohio State University Comprehensive Cancer Center – James Cancer Hospital and Solove Research Institute. 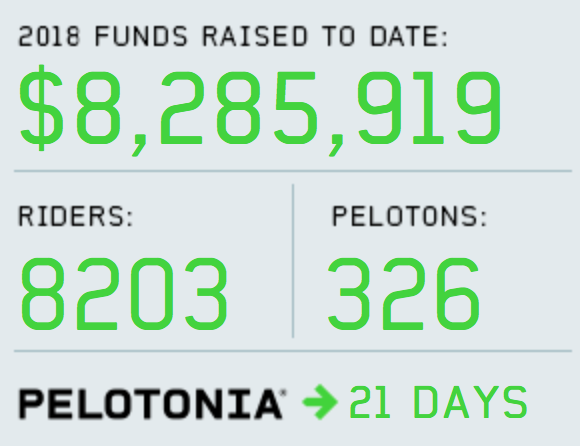 This year, Pelotonia has raised an additional $8,285,919! Participants raise money to either ride alone, or in a Peloton! But what is a Peloton? A Peloton is, essentially, a team of five or more individuals who share the Pelotonia experience. The Peloton can include Riders, Virtual Riders, or Volunteers, who all participate! The Ohio State University Comprehensive Cancer Center – Arthur G. James Cancer Hospital and Richard J. Solove Research Institute (OSUCCC – James) conducts scientific research that leads to cutting edge cancer diagnostics, treatments and prevention strategies. The OSUCCC – James’ more than 300 researchers and subspecialized oncologists are successfully and effectively speeding the discovery and delivery of molecular- and genetic-based therapies for individual cancers, leading to improved outcomes, faster responses, more options and fewer side effects. For more information on The Ohio State University Comprehensive Cancer Center – Arthur G. James Cancer Hospital and Richard J. Solove Research Institute, visit http://cancer.osu.edu.